All winning photobooks will be exhibited and for sale at the Griffin Museum of Photography and in the Online-Catalog-Gallery. 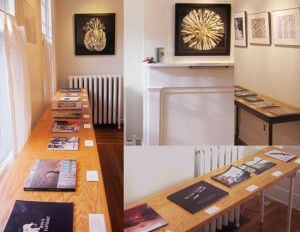 Twenty of the winning books will be exhibited and for sale at the Davis Orton Gallery. PHOTOBOOK, an annual competition, is open to photographers in the United States and abroad* who have self-published a photobook. There are growing options available for self-publishing a book such as on-demand (blurb, lulu, magcloud, etc. ); small run offset or web printing/publishing firms, binderies. If they have been hand-made/bound, they must be available in multiples of at least 25. Entrants may submit up to three different titles that are self-published photobooks of any size, format, or style. Twenty selected books will be exhibited and for sale in the Davis Orton Gallery. All photobooks, including those exhibited at the Davis Orton Gallery and online, will travel to Griffin Museum of Photography, Winchester MA and will be part of an exhibition, tba 2018. If sold, the artist will receive 100% of book purchase price. This “jury copy” of your book will be retained for exhibition if you are accepted into the show or will be returned if you are not accepted into the show. Some of you may wish to have your book sent to the gallery directly from your printer. That would be fine. If you pay by check mail it to the gallery with a note that the book(s) will be coming separately If you live near the Gallery, books can be dropped off at any time during gallery hours Saturday – Sunday, 11:00 to 5:30pm. How did you hear about Photobook 2019? international artists may choose to submit 2 books for jurying. If accepted, the gallery will retain one book as salable stock and one for exhibition. This may be more cost effective for the artist than shipping a purchase internationally. It is the artist’s choice. All books selected for exhibition must be for sale while in exhibition. The Gallery will take no commission. 100% of sale will be paid to the artist within 30 days of the close of the show. The artist agrees to pay for drop shipping sold book to purchaser. FOR US artists: Artists agree that each book sold by gallery will be shipped by artist to purchaser with 2-3 day delivery within a day of sale. NB: The retail price should be the same price that your book is sold for in other venues including on websites. All shipping and shipping insurance costs for books and photographs to and from the Gallery are the responsibility of the artist. Make sure your shipping box is sturdy enough to reuse for return shipping. Prepaid return postage (stamps only) and a pre-addressed mailing label or UPS shipping label must accompany all books and photographs.